These four sentences must be repeated on a continuous basis. When you repeat these sentences regularly, your subconscious memories - which are the only cause of your problems such as financial challenges, relationships difficulties, health issues or career hiccups - are deleted. It is important to understand that, from Ho’oponopono perspective, every problem affecting your life is a reflection of your own subconscious memories. As a consequence, when you repeat these sentences ("I am sorry", "Please forgive me", "I love you" and "Thank you”) continually, you are cleaning your subconscious memories. At the same time, you also resolve the problems created by these very memories. Many spiritual philosophies state that your internal world is reflected on your external world. Likewise, from the Ho’oponopono perspective, the problems affecting your life (your external world) are created by your subconscious memories (your internal world). Many sages state that in your subconscious mind lay the only cause of all your troublesome circumstances. In that sense, Ho'oponopono is very powerful because when you say these four sentences on a frequent basis, you are actually uprooting the cause of your problems, and these nettlesome situations tend to disappear almost effortlessly. It is important to pinpoint that this technique is intrinsically simple to apply, but you have to commit to its application. To that effect, you must say these sentences “I am sorry”, “Please forgive me", “I love you” and “Thank you” continually, because you have unnumbered subconscious programmes to clean. You can say these sentences in any order. You can even use some of these sentences, for example, "I am sorry” or “I love you". These sentences can be said in any language you know. These sentences can be said aloud, or in a silent manner. You can say these sentences either to yourself, or to Divinity. These phrases “I am sorry”, “Please forgive me,” “I love you” and "Thank you” act like a "password" which reconnects you with the loving energy from Divinity. This energy helps you clean your detrimental subconscious memories from your mental system. For this reason, you do not have to know what memories to clean, because every time you use this technique you are working in perfect alliance with the Divine. It is important to understand that Divinity always knows what subconscious memories must be deleted. Therefore, your only commitment is to repeat these sentences continuously. You might still not have realized that your entire life has been taken over by your subconscious memories. In other words, most of your actions, thoughts and emotions are actually ruled by your subconscious programmes. It is interesting to know that your subconscious memories have various origins: your forebears, parental programming, interactions with other people, impact of the media, etc. Some sages say that your mind resembles a house. Using this analogy, you perfectly know that if you do not tidy and clean your house on a regular basis, it will become untidy and filthy. Taking into account this example, you must say the four Ho’oponopono sentences ("I am sorry", "Please forgive me", "I love you" and "Thank you") on a continuous basis because you have numerous memories to delete. Moreover, you are constantly incorporating new programmes to your mental system. 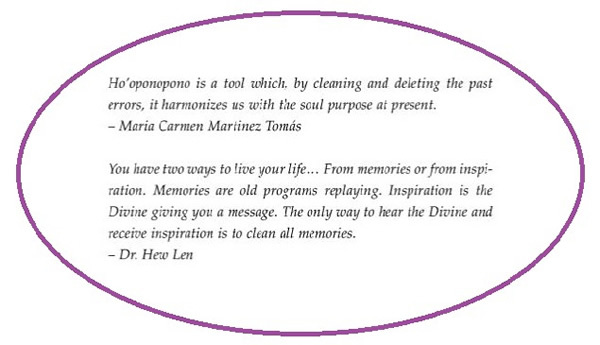 It is possible to say that Ho'oponopono helps you clean your "mental house" from clutter and filth (subconscious programmes). Ho’oponopono is different from most relevant healing tools, because it focuses on the cause of your problems, which are your subconscious memories. As a consequence, every time you say these sentences (I am sorry", "Please forgive me", "I love you" and "Thank you") you are eradicating the origin of your troublesome situations. As a consequence, these problematic circumstances are solved in a much more lasting manner, because you deleted their very cause. When you say these four sentences on a continuous basis you should not become anxious by trying to guess when your problems will get resolved. From the Ho'oponopono perspective, you should rest assured that all problems can be solved, with the committed use of this technique. Sometimes problems are solved in relatively short time; in other cases it will take a bit longer. Nonetheless, you should never get anxious about the timing regarding the solution to your problems. It is important to remember that, when you use Ho'oponopono, you are always supported by the Divine, whose timing is always perfect; always right. You should say these four sentences on a non-stop mode, which means in a regular way. If you do so, after a while, the use of these four sentences will become a very healthy habit of yours. These sentences can be said at any time: in the morning, at midday, in the afternoon or at night. When you use this powerful tool on a continual basis, unexpected and spontaneous changes will tend to happen in different areas of your life, for example: career, health, relationships, and money, among others. The last point to highlight is the matter of responsibility. From the Ho’oponopono perspective, you are encouraged to take full responsibility. In other words, you should fully acknowledge that each negative circumstance affecting your life without any exception has been created by your own subconscious memories. By taking full responsibility, you should practise Ho’oponopono on a regular basis to rid yourself from these subconscious programmes. When you fully commit to the use of this technique you will see, generally sooner than expected, that your life starts to unfold in a miraculous manner. Cignacco, B. R. How to Become a Miracle-worker with Your Life. Steps to Use the Almighty Ancient Technique of Ho' oponopono. Zero Books. UK ISBN 978-1-78535-121-1. 2015.